Anyone who knows me knows that I have a love/hate relationship with fan fiction. To me, it is the literary equivalent of song sampling, and I think any writer who borrows characters, plot or prose from another author should cede them a cut of all royalties. (E L James is to Stephenie Meyer as Vanilla Ice is to David Bowie and Queen.) 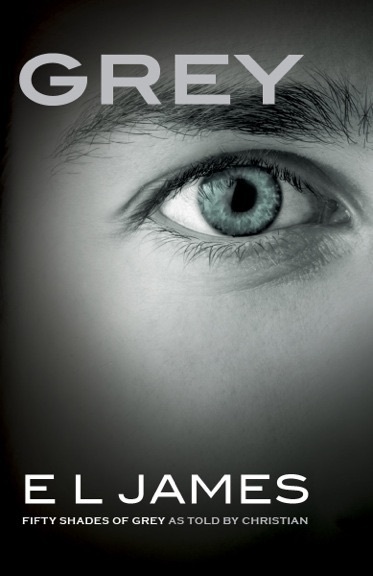 That said, anyone who knows me probably also knows that I have BIG LOVE for FIFTY SHADES OF GREY–no lie and no shame. Sure, even a rudimentary edit to shape the story and remove excess verbiage (and to edit this trilogy is one of my ongoing fantasies) would have reduced the books by 30%, and probably have saved them from much ridicule. But, even in their current form, James brought several things to the table for her story, including a charismatic hero and some clever writing–the email exchanges and Christian’s “if you can’t beat ’em, join ’em” line being but two examples. I would go so far as to argue that Christian Grey is a more compelling figure than TWILIGHT’s Edward Cullen and, to me, a more romantic one. Thus, I was giddy when the publication of GREY, a FIFTY SHADES retelling from Christian’s perspective, was announced earlier this week. Never mind that the alternate POV novel is almost de rigueur these days (not to mention that it has also already been done by Stephenie Meyer). I literally giggled at the news, because anyone who has read the trilogy will agree that the books come alive most when Christian is on the page. And on June 18, we’ll get to be inside Christian’s head for 500+ pages. I think it will be, as Ana might mutter, “teeth-clenchingly good.” It appears that fan fiction is here to stay (thanks, Internet). And while it remains to be seen what contributions, if any, fanfic may make to the canon of great literature, even if it only serves as pop culture junk food, rather than a gourmet meal, in the case of GREY, I think it will be delicious.